House fire Burgh is a prachtiug mansion from the 17th century. 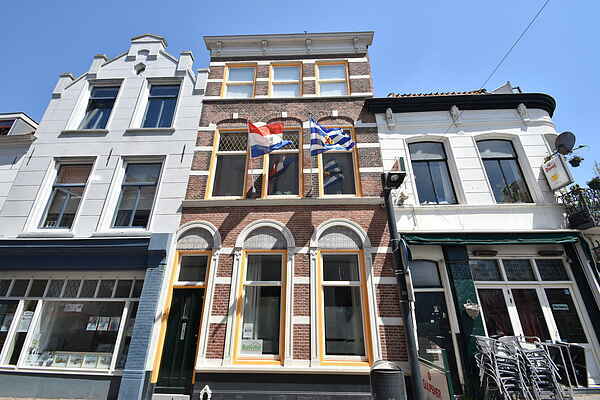 The house is situated in the oldest part of Vlissingen. It is located in the shopping street of Flushing about 3 km long, full of nice shops, bars and Lunchrooms. Flushing is a popular tourist resort with many nice restaurants and attractions. The beach and the Boulevard are a stone's throw from the vakantiehuis.Het house is decorated like a mansion built in 1800 and has high ceilings and ornaments. The house exudes a lot of atmosphere. You feel like going back in time. This device is combined with modern elements making it a perfect holiday for lovers of style. From the apartment you can make beautiful beach walks, visiting the port of Vlissingen, the ferry over to Zeeland Flanders and many other fun activities. WINNER of the "best HOST AWARD 2016"!! (Best host and hostess 2016) The HOUSE IS a BEAUTIFUL, large (750 M3), RESTORED home. IT CONCERNS the WHOLE HOUSE which CONSISTS of a LARGE LIVING/BEDROOM on the GROUND FLOOR, living room with GREAT NOSTALGIC KITCHEN on the FIRST FLOOR and TWO BEDROOMS and a VERY LUXURIOUS BATHROOM on the 2nd floor. THESE ARE ATTRACTIVE LEVELS WITH HIGH CEILINGS MAKING THE STAIRS PRETTY LONG. THE BATH/SHOWER COMBINATION HAS A HIGH ENTRY LEVEL. BY THESE TWO ISSUES, THE HOUSE IS NOT REALLY SUITABLE FOR PEOPLE WHO ARE LESS WELL TO LEG. At the MOMENT THERE IS 1 LARGE LUXURY BATHROOM on the SECOND FLOOR and THERE is a SECOND BATHROOM on the GROUND FLOOR IN the PLANNING. IF YOU WANT TO KEEP IN MIND IF YOU A.U.B. WITH A LARGER GROUP. IT IS A NON SMOKING HOUSE BUT ON THE GROUND THERE IS A PATIO WHERE YOU CAN POSSIBLY GOND. YOU CAN PARK THE BEST TO THE LARGE CAR PARK AT THE WILHELMINALAAN. The POS TERMINAL KNOWS HERE DAY TICKETS A 8 EURO PER day. SEE FOR AN EXTRA DETAILED DESCRIPTION; SEE WWW.VAKANTIEHUISVLISSINGEN.NL For ALL ACTIVITIES And The WATER LEVELS IN And AROUND FLUSHING; WWW.BADKOERIER.NL SEE For TOURIST TIPS; WWW.STADVLISSINGEN.NL We Would Like To Welcome You! FOOD And DRINKS VLISSINGEN IS A TOURIST CITY Par Excellence. EVERYWHERE YOU CAN FIND PUBS OR RESTAURANTS.